Average Weight	: 45 - 66 lbs. Photo Courtesy of : National Entlebucher Mtn. Dog Assoc. 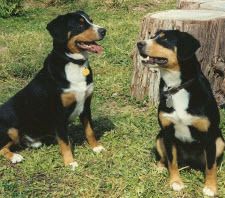 The Entlebucher is named after a town and region in the Swiss canton of Lucerne. It is the smallest of the Swiss mountain dogs. While its origin is not certain, it is thought to be descended from the fighting and guarding mastiffs of the Roman legions. This breed is popular in Switzerland, but is rarely seen outside its native land. This rare breed was saved by the diligent efforts of Franz Schertenleib. Schertenleib heard of the many different Swiss mountain dogs that existed. In the 1800s, with the help of a Zurich show judge, Professor Albert Heim, Schertenleib scoured the Swiss Countryside searching for mountain dogs before they became extinct. The Entlebucher Mountain Dog is a people-dog that loves to be surrounded by people and friends. Alert and very eager to please. This breed was developed to be used as a cattle driver; today it is used as a livestock guarder and a companion. The Entlebucher needs a firm, but calm, consistent pack leader who can properly communicate with the canine animal. This is a breed that needs regular exercise: walks or jogs, where the dog is made to heel beside you or behind the lead, as instinct tells this breed that the leader leads the way, and that leader needs to be you.